Why Remove Low Value Links? Why do I need to remove low value links? Ever since Google introduced their Penguin algorithm in 2012 many sites have suffered, dropping down the search engine rankings and losing traffic. The Penguin algorithm affected the way Google took into account links, reducing the influence that low quality and low relevance links have. A lot of old link building tactics included building a lot of lower quality links that also included a number of key search terms. This tactic doesn’t work these days because of Google Penguin, as it can have a negative impact on your website and ultimately can lead to a link penalty on your site. However, this is where low value link removal can help you. Whether you have been affected by Google Penguin or not, removing low value links can help your site to improve its rankings and can help you remove a link penalty if you have one. Before removing links it is important to understand a website’s backlink profile. This is the information about all of the links that point to a website, how many and what quality they are. By looking at this you are able to identify which links need to be removed. There are two ways to remove low level links, you can contact the websites that are linking to you and ask them to take the link down. 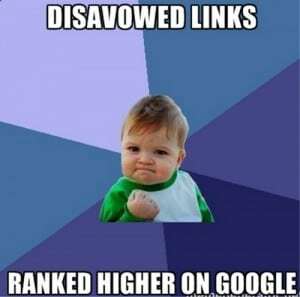 Or you can use the link disavow tool which Google have introduced to help website owners to clean up their backlink profile and recover from any link penalties they might have accrued. Using the disavow tool is quicker than contacting website owners directly, especially if you have a lot of links that need to be removed. Although the disavow tool doesn’t actually remove the link, it does notify Google that you don’t want that link to be counted towards your ranking. When submitting links to be disavowed you can either disavow whole domains or individual URLs. If you are unsure whether you should disavow a link or not you can always leave it, adding it to the disavow file at a later date. Disavow files do not need to be completed all at once; you can add or remove links from the file as needed. Removing links can take a while to visibly affect your website’s ranking and traffic but in the long run it is really important to make sure that your backlink profile is healthy. Search engines are going to continue to penalise low quality links so it is important to make sure that your backlink profile has strong links. Have you any experience of low value link removal? It would be great to hear how it worked for you. If you have any questions, please do leave us a comment below.